Calling all Buffalo Chicken lovers! 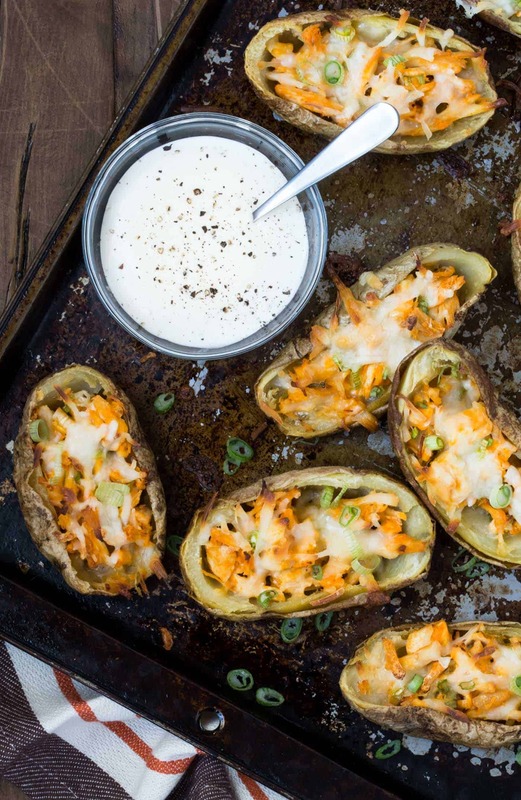 These Buffalo Chicken Potato Skins taste so good, you’ll never order them at a restaurant again. What is it that about buffalo sauce makes me love all things buffalo? Is it the rich spicy sauce with subtle heat? Is it the cheesy goodness that goes oh so well with it? Or is it the creamy ranch sauce that brings all the flavors together? The answer? Yes. It is all those things that make these Buffalo Chicken Potato Skins one of my new favorite appetizers. I baked the potato skins in the oven (twice to get the skins nice and crispy) which took a little longer but was totally worth it. And since these are baked, not fried, I saved some calories and a whole lotta mess. Who wants to spend the time cleaning up splattered grease when I can be eating Buffalo Chicken Potato Skins instead? Not me! Now I rubbed my potatoes with olive oil and sprinkled kosher salt on them before I baked them. A small effort but I love the flavor it adds. Feel free to cut the prep time by popping the potatoes in the microwave before you scoop them out. You will still get delicious results. Another great time saver I have for dishes like this is rotisserie chicken. I buy a couple at a time, cut the meat up and store it in the freezer in 2 cup packages. Pull one out to defrost and I’m ready to go. Now technically the Buffalo Chicken Potato skins are meant to be an appetizer, but they have been dinner here too. I just add a big green salad on the side, and they become the main course. They’ve got chicken on top, so it totally works, right? At least that’s how we roll in this house. And love every bite. All the buffalo, all the time. Preheat the oven to 400 degrees. Clean the potatoes and pierce the skins with a fork. Rub the olive oil on the outside of the potatoes and sprinkle with kosher salt. Bake for 1 hour or until potatoes are pierced easily with a fork. Once the potatoes are cooked through, remove from oven and let cool slightly. Combine the melted butter and Frank's Red Hot Sauce in a medium bowl. Add the diced chicken and stir to coat. Set aside. Slice the potatoes in half and scoop out most of the potato flesh, leaving about 1/8 of an inch or more around the edge of the skin. Reserve for another use. (I make mashed potatoes.) Brush the inside of the potato with olive oil and bake for an additional 15 minutes. Remove skins from oven and divide the chicken evenly among the 12 potato skin halves. Top with desired amount of shredded cheese and bake for 15 minutes or until cheese is melted. Top with scallions and serve immediately. What adorable nibbles! 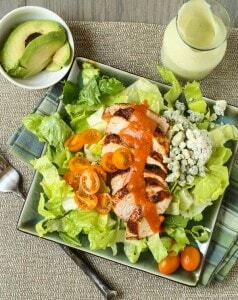 I also adore Buffalo sauce and this genius idea! We would most definitely love these. 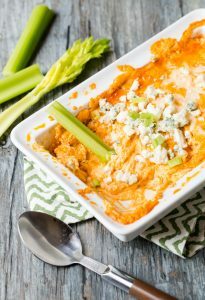 Buffalo chicken obsessed right here! Appetizers are some of my favorite dinners. Sometimes I just want a whole table of appetizers rather than a main course. 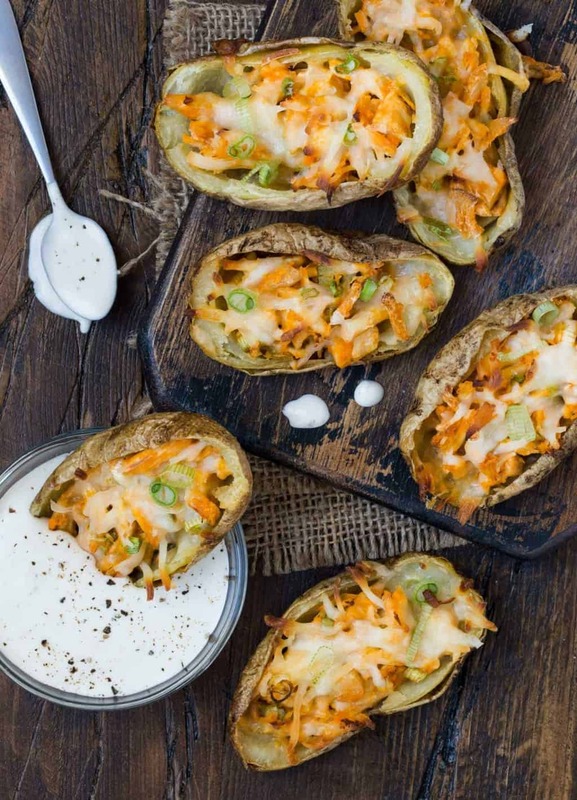 I loe all kinds of stuffed potato skins – these look particularly yummy, not to mention incredibly easy. I’ll do all Buffalo all the time too! It is my favorite kinda foods! I love your time saving tips, especially the rotisserie chicken. But this recipe, man it speaks to me. I’d probably serve it for dinner too!